The long standing chain restaurant Ruby Tuesday, founded in 1972, is still going strong today in 2014. Most restaurants of comparable menu options and meal pricing have fallen to the wayside as Ruby Tuesday has adapted over the years to be one of the best restaurants around. Other restaurants have faded from the forefront of people’s minds over the years, becoming the dining site of last minute plans and for those who aren’t looking for something exciting but instead are focused on getting something they know. Over the year Ruby Tuesday has only gotten better over time. Starting out as a single restaurant in 1972, over the years it has adapted to the changing world to become huge beacon of success. Instead of relying on signature items to support their franchise, over the years the Ruby Tuesday menu has adapted their options to appeal to a variety of people. Upon entering one of these establishments one will find the atmosphere to be welcoming but at the same time the appearance is very different from other chain restaurants. The colors and lighting reflect a more high class appearance than going to Applebee’s or a TGI Friday’s, while still getting all that those establishments provide and more. While it originated as a typical “American food” restaurant it has become a leader in modern eating. Being one of the first restaurants to provide “healthy eating” options on its menu and providing a variety of “skinny” drinks at their bar. Reasons such as this are proof that this restaurant is superior to those who attempt to compete with this. One of the greatest things about Ruby Tuesday is that they have retained their self- service, all you can eat salad bar. 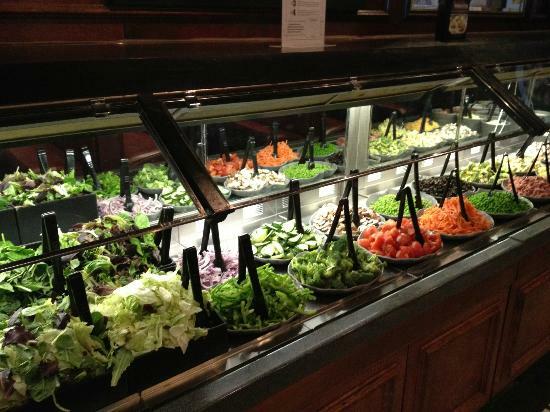 At many restaurants, including Ruby Tuesday there are many options for salads that you can order off the menu; but my favorite thing about this restaurant is that there an option to just order the salad bar. Their salad bar is a wonderful addition to their menu that allows the customer to create their own salad from a variety of options. While other restaurants may offer a salad bar as well the variety of options that Ruby Tuesday provides its customers with is remarkable. It including four different lettuce options, all the typical salad toppings (tomatoes, cucumbers, carrots, peppers) and many other toppings such as: hard- boiled egg, bacon bits, ham and many more. But the variety doesn’t stop there, there are many salad dressing options as well as the option to create your own using olive oil and vinegar. And then finally, to top your amazing salad off are the most amazing croutons that you have ever encountered, pumpernickel bread croutons. For me these croutons are what sets Ruby Tuesday apart from others who offer a salad bar, these croutons have a special texture, crunchy on the outside and soft and chewy on the inside, that takes croutons from being a hard crunchy topping to the star of the salad. Nothing can compete with the Ruby Tuesday salad bar which can be ordered individually or in conjunction with another dish which there are many of, varying from burgers to seafood, all of which are delicious. I strongly encourage anyone who hasn’t experienced the joy that is this restaurant. I guarantee that it will make its way to the top of your list of go to restaurants; perfect for last minute plans or long standing appointments.